Lil Poco Jess Tivio – Maverick – A local boy with a big future. Maverick is local to Clea and I – he stands at Rocky Fork Ranch in Lucas Ohio – Laura Blanton and Krystal White manage this stallions future and are looking to put some babies on the ground for barrel racers to get those extra incentives. Maverick has a few babies on the ground now that are just coming of age and growing to start their jobs in the barrel racing world or any other profession of choice. With 100% foundation this stallions off spring’s will not only make barrel horses but reining, cow horse, therapy horse whatever your discipline is Maverick will certainly give you a great start. His 100% NFQHA is a prime example of what a true foundation quarter horse should be! Maverick is intelligent, athletic, muscular, versatile, and a true gentleman. Maverick is the work of a young girl’s dream becoming a reality with loads of hard work, sacrifice, persistence and stubborness, just as a cowgirl should be! Maverick is bred like the best, boasting the lines of King, Poco Bueno, and Poco Tivio. These horses are known for their willingness to work, easy trainability, friendly dispositions, intelligence and fortunately, their good feet! 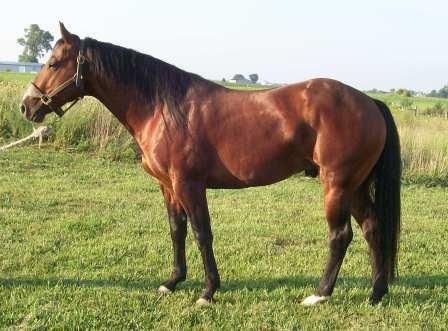 Maverick is a bay 2005 stallion who’s pedigree reads like the true blood of the foundation quarter horse. He is 35% Poco Bueno with 11 crosses, and 21% King with 15 crosses. Maverick has the easy trainability known of the Poco horses and is as smart as they come. He is sane and level headed, easy to handle and just a joy to be around. He sports a great hip, good shoulder, good muscling and that perfect head. He is extremely versatile and will make a great choice for any type of mare. Boasting his 100% foundation lines, breed him to your foundation mare to perserve the foundation line. Cross him on your High Brow Cat or Dual Pep mares to get that modern cow sense on a level head for your perfect cow horse. Or use him for your running bred mare to get a foal with speed, agility and sanity to make your next star barrel horse! The possibilities are endless.